The short-lived success of Damien Hirst’s first Pharmacy clearly hasn’t deterred the artist, but it did take him a while to follow his lauded 1998 Notting Hill outpost. Pharmacy 2 is a more accomplished attempt, helped in no small part by Mark Hix, who has created a modern-British fish-heavy menu for his collaborator and friend. Roast Lyme Bay monkfish tail with rosemary, and Dublin Bay prawns with Arak, wild garlic and fennel pilaf are sourced from Hix’s native Dorset, alongside shaved winter squash with trevisano and graceburn cheese and a Glenarm Estate 75 day aged marbled sirloin. 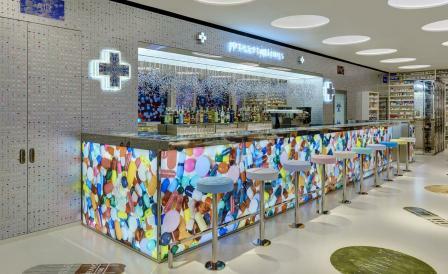 Located above the Newport Street Gallery in Vauxhall in a converted Victorian brick build by architects Caruso St John, the brash lighting and hospital waiting room colours might make you squint, but appreciate the attention to detail here; cabinets stacked full of medicines line the walls, bar stools are topped with giant squishy paracetamol pills and glinting helix strands decorate a bar that incorporates a stainless steel and glass vitrine. Come before 6pm to tour the gallery, which contains over 3,000 works from Hirst’s own collection as well as contemporary works by young and emerging artists, then venture upstairs for dinner amongst some of Hirst’s own paintings, such as the butterfly ‘Kaleidoscope’ series.